Artificial Eye's third collection of films from the Finnish maestro Aki Kaurismäki would on paper have made more sense as the first. This is vintage Kaurismäki, a four film set that includes his first two features and is the only collection so far to include an extra of any sort, one that could in part have served as an introduction to the director's work. But there is a logic to working backwards, starting us off in more familiar territory and films that practically define the Kaurismäki style, before moving to the ones that bend it. It's an intriguing quartet that includes adaptations of works by Fyodor Dostoyevsky, William Shakespeare and Henri Murger, plus a Buñuelian surrealist comedy. 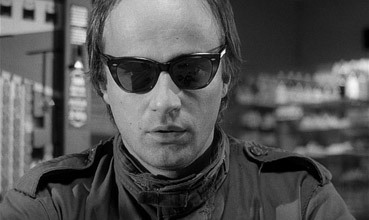 Three of the films are in black-and-white, one is set in 1960s Paris with French dialogue, and all four feature Kaurismäki's favourite actor Matti Pellonpää, usually in support roles, his only starring role being in a language he did not speak. And once again, every one of them is absolutely worthy of your enthusiastic and undivided attention. It's almost inevitable that if you're commenting on Kaurismäki's filmography, you note the riskiness of attempting an adaptation Dostoyevsky's Crime and Punishment as a first feature, a work that could just as easily have made or prematurely broken the career this then budding filmmaker. 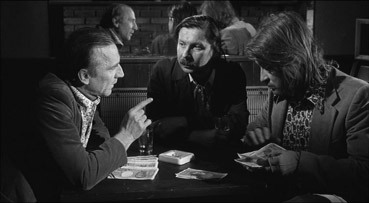 According to Kaurismäki, whose word can never be trusted when talking about himself or his filmmaking, he had two solid reasons for the choice. The first was that if he was going to fall he'd rather do so from a great height rather than a few centimetres, and the second was that Hitchcock himself had proclaimed the book was too difficult to film, to which Kaurismäki's reaction was, "I'll show you, old man." The original story is updated and relocated to modern day Helsinki and those familiar with the novel should have little trouble separating Dostoyevsky from Kaurismäki. On what appears to be a day like any other, slaughterhouse worker Rahikainen finishes his shift, then goes to the flat of 50-year-old businessman Honkanen and shoots him dead. Instead of fleeing the scene he calmly sits and contemplates his surroundings until interrupted by the arrival of Eeva, a caterer hired by Honkanen to furnish a birthday party planned for that evening. Rahikainen calmly tells her what he has done, urges her to call the cops and leaves. Even with Eeva's help, the police have few clues to identify the murderer, her description of him as "more like a lunatic, with a strange stare" prompting investigating Inspector Pennanen to remark, "that only increases the number of suspects." A probable motivation for the crime is supplied when the police find out that Honkanen stood trial for a hit and run killing while under the influence three years earlier, but escaped conviction due to a lack of evidence. Rahikainen, meanwhile, drops round to see Eeva at her workplace. He wants to talk to her but she's not that keen, having enough on her plate fending off the unwelcome advances of her department head Heinonen. However, when she is asked by Inspector Pennanen to identify Rahikainen, who is now the chief suspect, she declines to do so. An uneasy friendship develops between Rahikainen and Eeva, but Pennanen remains determined to get his man. Where Dostoyevsky's Raskolnikov was increasingly tortured by his crime, Rahikainen remains largely untouched by the killing, his emotional and moral detachment extending to a seeming lack of concern for his own capture. His encounters with Pennanen have the air of a game of wits, but one in which Rahikainen willingly partakes, less for self-protection than for the intrigue of the game itself. It's no surprise that these scenes are some of the most gripping in the film, a tightly written and directed flipside to the minimalist dialogue of much of Kaurismäki's later work. Crime and Punishment is a bold and disarmingly assured first film in the recognisable Kaurismäki style, complete with his careful camera placement, economical editing and low key approach to performance, although his characteristic deadpan humour is only fleetingly glimpsed here. An intriguing interpretation of a classic novel, it's also compelling and pleasingly self-contained – you won't need even a passing knowledge of the book to appreciate the movie. If the first hook of a film, beyond the less reliable ones of director and cast, is the originality and intrigue of its story outline, then try this for size. In a Helsinki basement, seventeen very different men, all but one of whom have the first name Frank, meet to embark on a quest to find the fabled district of Eira on the far side of the city, a Homeric journey that will separate and reunite them and leave many of them dead. Calamari Union is Aki Kaurismäki's most openly surrealist film, and I'm awarding that badge as one of honour. This is not a filmmaker tinkering with the form but a headfirst plunge, infused with a Buñuelian sense of the logically absurd and a generous dose of inspired silliness worthy of Monty Python. And yet it remains at all times a distinctively Kaurismäki work, from the casting and characters to the deadpan delivery and super-tight construction. If you're not in tune with the Kaurismäki style then I have no doubt you could compile a sizeable list of things about Calamari Union that you find annoying. Be my guest, but it's a list I have no interest in reading. For my money Kaurismäki's second feature is an absolute riot, and a consistently and deliciously inspired one. As with Buñuel at his most playful, Calamari Union appears to be taking place in a recogniseable reality, but one whose logic is governed in part by the fractured laws of the dream world. A journey to the far side of the city should be a simple one in an age of mass transit, but the group choose to travel when public modes of transport have all shut down for the night, and are blinkered by sunglasses and armed only with a few coins handed out as a communion rite at the journey's outset. It's a trip that kicks off with the stealth and co-ordination of a carefully planned heist, as the small army of Franks break into an underground station and steal a train, but on disembarking they suffer their first fatality when one of their number is shot by the official driver, who has just woken from his chloroformed sleep and disappears with his train before they can react. Not that they do, of course – this is, after all, a Kaurismäki film. From here on any sense of group coordination is thrown to the wind, as the surviving Franks and a man named Pekka, who spends the film reciting stumbling English phrases as if through a brain-damaged foghorn, scatter to find locations for sleep. One steals a bag a blags a hotel room, two more bed down in a cinema, while others find themselves in less glamorous locations that are revealed the following morning with comic panache. One even falls willingly into a river and drowns, prompting his companion to leap onto the bonnet of a passing car, which spends rest of the night driving around the city before dumping its passenger in front of the café the group have selected as a meeting place. The comic absurdities come thick and fast and without even a flicker of a smile, but have an interconnecting poetry that gives them a surprising if sometimes oblique narrative cohesion. The slow disintegration of the group in particular is handled with intriguing diversity, from the random (an unexpected assassination) and the accidental (one Frank inadvertently kills another in the process of duping a passer-by) to the hotel squatter who finds himself unable to leave a woman he has fallen for, or the one lost to the trappings and social distance of the business executive class. The dialogue has a similarly cut-up quality, with three of the Franks given to almost random musings on the nature of existence, some of which form into persuasive observations about life at the bottom of the social ladder. In one memorably compelling monologue borrowed from poet and screenwriter Jacques Prévert, to whom the film is co-dedicated, the always splendid Matti Pellonpää argues that society offers better protection to a tin of sardines than a man who has not eaten for three days: "Dead fish protected by tins, tins protected by windows, windows protected by the police, police protected by fear. Such a barricade for six wretched sardines!" Such interludes are anything but superficial and point to a sociopolitical reading of the whole film, ordinary men united by an everyday name on a quest for a better life, their journey repeatedly frustrated by society and its reaction to their sometimes anarchic lifestyle. But even without this, Calamari Union is a straight-faced, comic-absurdist delight that had me giggling helplessly right up to the closing frame. There's even an unexpected plot pause to allow the surviving Franks to find five minutes of fame as a high energy rock group, a favourite Kaurismäki interlude that appears in three of the four films in this collection. 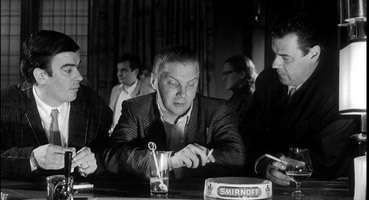 In an interview I've been unable to track down and credit, Kaurismäki memorably revealed that this was the only film he had shot while he was either drunk or under the influence of a serious hangover. The message is clear – give this man more booze. No-one could accuse the younger Aki Kaurismäki of lacking ambition. Having started his feature career by adapting Dostoyevsky, just three films later he took on Shakespeare too. There's a logic to updating Shakespeare's Hamlet to the modern industrial world, where the power games played by kings and princes of years past are re-enacted by the heads of multinational corporations in the new commercial world order. Here Hamlet is not a Danish prince but the idle son of a successful and powerful industrialist who has been poisoned by his colleague Klaus to allow him to marry Hamlet's mother and take over the business. Hamlet suspects nothing until his is paid a visit by his father's ghost, who wises him up to Klaus's misdeeds and urges him to avenge his death. Hamlet's behaviour starts to become erratic, and after failing to get to third base with his girlfriend Ophelia, he insults her brother Lauri and blocks a deal designed to transfer all of the firm's interests to a Swedish rubber duck company. Lauri departs for Stockholm to continue his studies, but not before warning his sister not to sleep with Hamlet, whose words and actions are starting to cause concern at the top. It all comes to a head when he accompanies his mother and Klaus to a play whose actors have been bribed to re-enact the murder of his father, much to the outrage of Klaus, who begins making plans to remove his troublesome stepson from the picture. I don't need to go on, do I? Unless you're completely new to Shakespeare's tale then you'll have a good idea how the rest plays out, as save for a final plot twist and an undercurrent of revolutionary socialist politics, Hamlet Goes Business is surprisingly faithful to the original, at least in terms of plot. Shakespearean dialogue has been largely replaced by a matter-of-factness that will doubtless raise a few scholarly smiles. The encounter with his father's ghost in particular is stripped of its eerie mysticism, the spirit's existence revealed through a casual remark by security guard Vartija ("We saw your father last night") and its arrival by a rap on the window. Their conversation is reduced to a few brief lines governed more by mutual irritation than fear, Hamlet's response to the spirit's impatience being, "Get on with it. It's cold and I don't want to be late for dinner." The play is similarly pared down and inevitably updated. Swords are replaced by guns, Polonius is shot while hiding in Gertrud's wardrobe, conversations are overheard with the aid of bugs and closed-circuit television, Rosencrantz and Guildenstern are corporate thugs, and wandering minstrels are replaced by a furiously energetic rockabilly band. The climactic duel is over in a matter of seconds and includes one of the most bizarre images you'll see in a Kaurismäki film, as the disarmed Lauri is killed by having a radio jammed on his head, prompting him to dance about like a short-circuiting robot. It's an intriguing adaptation of the play and would make a fine introduction for those who get nervous at the very mention of the bard's name, though it's quite possible they'd also get twitchy at the idea of watching a film in the Finnish language. 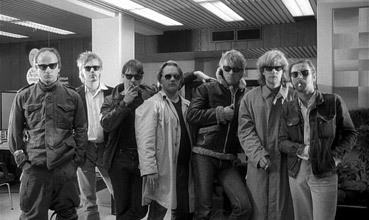 Although not quite as compelling as the director's other literary adaptations, it's nonetheless consistently enjoyable in the Kaurismäki style, particularly the deadpan delivery, blackly offbeat comedy, cinematic economy and eclectic collection of borrowed tunes, some of which are used to infuse moments of high drama with a sense of exaggerated theatricality. And if you're a collector of deliberately dreadful puns, don't miss Hamlet's first words, which for the sheer balls of their inclusion have to be heard (or, unless you're a Finnish speaker, read) to be believed. The story goes that Kaurismäki spent many years trying to adapt Henri Murger's novel Scenes de la vie de bohème for a film that would relocate the story in Helsinki before finally admitting that it could only take place in its original Paris setting. The resulting film, La vie de bohème, is one of only a spattering made by Kaurismäki not set in Finland and primarily in the Finnish language, and his only one in French. One of four literary adaptations in the director's canon (the others are Crime and Punishment, Hamlet Goes Business and Juhar), it's the one that appears to be most reverential of its source and the only one that plays it straight, so to speak. And if you think you know your way round the cinema of Aki Kaurismäki, as I did, it might just surprise you. La Vie de bohème is the story of three down-on-their-luck artists in 1960s Paris who are bought together by chance. 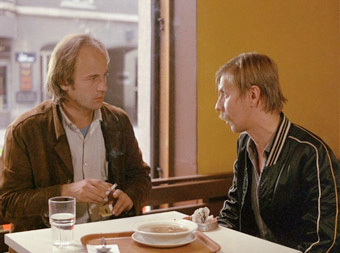 Writer Marcel (André Wilms) is evicted from his flat owing three months' rent and finds himself in a café with Albanian painter Rodolfo (Matti Pellonpää), with whom he shares a meal and a few drinks. Keen to continue the lively discussion that follows, the pair return to Marcel's former flat to find it now occupied by avant garde composer Schaunard (Kari Väänänen). Another bottle is opened and a friendship is formed. Having suggested Marcel as the central character in the opening scenes, the film then switches focus to Rodolfo and his quest to woo Mimi (Evelyn Didi), a girl he finds waiting in the corridor of his apartment building and who he offers a bed for the night, nipping out to sleep in the cemetery to protect her from his hot blooded nature. The lives of the three men continue to interconnect in sometimes amusing fashion, as when Rodolfo calls on Marcel to borrow money for paints and discovers (as we do) that he now has a girlfriend, or when Marcel bursts into Rodolfo's apartment with a desperate need to borrow a black jacket for an interview with publisher Gassot (a cigar-chewing Sam Fuller), only to have the dinner-jacketed Blancheron (Jean-Pierre Léaud) immediately walk in and enquire about having his portrait painted. The narrative develops along these lines, encounters and observations involving one or all of the three men that collectively constitute more a record of a time and lifestyle than a story in the traditional sense, despite the plans the three men make for their future prosperity and a mid-film disruption that sees Rodolfo deported, with subsequent consequences for his relationship with Mimi. What does catch you out, given Kaurismäki's deserved reputation of the master of deadpan, is the clear affection he has for his characters and that they have for each other. It's almost as if the change of location unlocked a hitherto hidden aspect of the director's artistic leaning, resulting in a film that feels more French than Finnish, if such things can be said to be definable. La Vie de bohème is a film that comes as much from the heart as the head and is the only Kaurismäki film I've seen that is not instantly identifiable as such, despite the presence of favourite actor Matti Pellonpää. There are nonetheless plenty of his signature touches, particularly in a first half dotted with surrealistic and absurdist asides, from the two-headed trout served to the dining Rodolfo and Marcel, and Schaunard's violent response to being expected to pay for a taxi ride, to dialogue that identifies a piano as a violin and a self-portrait of the moustached Rodolfo as one of his mother. It's a film that lives through its characters and setting and both are vividly and warmly drawn, while the performances are so effortlessly entrancing that it's easy to forget that there was a language barrier to cope with (apparently neither Pellonpää nor Väänärd spoke a word of French and pronunciation instructions were included in the script). Evocatively shot by regular lensman Timo Salminen and edited with an economy typical of the director, La Vie de bohème provides us with a rare glimpse of Kaurismäki the tender-hearted European neo-realist, a poignant, uplifting and genuinely moving portrait of ups and downs of the bohemian lifestyle, and a touching and respectful nod to struggling artists everywhere. Crime and Punishment is framed 1.33:1 and in colour, the rest are anamorphic widescreen and in black and white – Calamari Union is 1.66:1, the others 1.85:1. The monochrome beauty of Calamari Union and La Vie de bohème is impressively rendered, with outstanding contrast, detail and tonal range in both. There is some minor damage to the Calamari Union print that has been digitally cleaned up. Crime and Punishment is in similarly fine shape, a generally excellent transfer that only slips a little in the darker scenes, which have a slight flicker to them. Hamlet Goes Business fares slightly less well, with a softer picture and a more visible grain than the other films, and there is some minor picture flickering in places. Contrast is still very good and black levels on all four films are spot on. The Dolby 2.0 mono tracks on all four films matches the standard set by the previous two collections in their clarity and above average dynamic range. There's no reason why films from the 1980s and 90s shouldn't sound this clear, of course, but it's surprising just how many do not. As well as upping the film quota to four, this collection also has one over on its predecessors in the shape of the first extra feature of the series. This was part of a four-programme series made for Channel 4 in 1990, when The Match Factory Girl was on release and the youthful Ross sported the sort of large spectacles whose day in the fashion sun has long since passed. In some ways it's a useful introduction to Kaurismäki's work, containing as it does a number of extracts from his early films and two typically cheerless interviews with the man himself, though I'd still save it until after you've seen the movies, as key plot points and even an ending are given away here. Originally filling an hour-long slot on TV, minus ten minutes or so for commercial breaks, the version here has clearly been cut down by at least ten minutes, with all references to the 1989 I Hired a Contract Killer removed. Presumably this is a rights issue, hence its non-inclusion in any of Artificial Eye's sets. The most comprehensive collection yet in Artificial Eye's welcome series is also the most diverse, a persuasive challenge to any suggestion that Kaurismäki has spent much of his career reworking the same story and characters. The transfers are once again of (largely) exceptional quality and there's the additional draw of the extra feature, which is enjoyable despite the trimming. For Kaurismäki fans this is once again an essential purchase, and the best value Kaurismäki Collection yet.